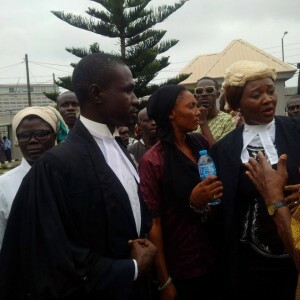 Sehinde Ebiesuwa was the first person to arrive at about 7.00 a.m. for the court hearing scheduled for 9.00 a.m. at the Federal High Court in Lagos. He is the 2nd Plaintiff in the matter SPACES FOR CHANGE filed in May 2016 to challenge the September 18, 2015 forced evictions and demolitions in Badia-East community, which rendered thousands of families homeless at the peak of the torrential rainfall. The Ojora Chieftaincy Family, with technical support from the Lagos State Government, ordered and effected the demolitions without notices, resettlement and compensation. The Family has gone ahead to commence construction work on the demolished portions of the land between Orile Iganmu, Ijora Express Road and Container Terminal to Ebutte Iganmu, in Ijora Badia East, Lagos State. Not long after Sehinde’s arrival, other community members began to arrive in twos, threes and fours. Gradually, the crowd swelled, with over 50 evictees – men, women, the youth, and even teenagers – showing up in court! The courtroom could not take many of them, yet they were happy to stand by the doors, or windows, or anywhere from which they could watch the proceedings. To them, it was a day like no other. At last, they could smell the scent of justice denied them for so long. The day was indeed, special: the process of getting legal redress has finally commenced for the first time in nine months, after several unfulfilled promises. Defending the demolitions, the Ojora family claim that they acted pursuant to a court order granted by a Lagos High Court. The evictees were neither aware of, nor were parties to the suit, and therefore, never had the opportunity of presenting their case before the court to have their interests in the land at Badia-East determined. They insist that the judgement does not bind all the evicted members of the community. The evictees were brought unto the land by the Federal Government of Nigeria after the Federal Government acquired their lands in 1973 for the purpose of erecting the present-day National Arts Theatre, Iganmu. At that time, the Federal Government gave monetary compensation to some of the landowners while some others, including the current evictees, requested for resettlement. They were resettled on the land at Ijora Badia East; the same area the Ojora Family has now forcefully evicted them, without any prior negotiation, meaningful engagement, resettlement and compensation. Yielding to the petitions and sustained advocacy pressure by SPACES FOR CHANGE, the Lagos State Ministry of Local Government Affairs on Wednesday, October 7, 2015, convened an urgent dialogue involving relevant state agencies, specifically the Ministry of Justice, Ministry of Urban Development, Ministry of Housing, Civic Engagement, the Ojora Family, Badia evictees and residents toward the exploration of a lasting solution to the recurrent human rights abuses and forced evictions in Badia. The Lagos State Government, at this meeting, issued a stop-order directive on further evictions in any part of Badia. In further response to SPACES FOR CHANGE’s frontline advocacy for the compensation and resettlement of Badia evictees, the Lagos State Government in November 2015, through the Office of Communities and Communications in the Lagos State Ministry of Local Government & Chieftaincy Affairs, launched an alternative dispute resolution vehicle – known as the Communities’ Conflict Resolution Forum (CCRF) – for resolving the convoluted legal and human rights issues arising from the September 18, 2015 demolition of Badia community. Brazenly disregarding the October 7, 2015 directive of the Lagos State Government including the combined efforts to reach an amicable resolution of the multifarious human rights issues connected to the September 18, 2015 demolition exercise, Badia evictees have been continuously targeted with eviction threats, arrests, intimidations and detentions by agents of the Ojora Family. The ongoing construction work on the demolished land is the latest in a series of acts of impunity, aimed at dehumanizing the evictees. Further aggravating the inhuman or degrading treatment Badia evictees are facing is their increasing vulnerability to public health and environmental hazards. This has resulted in incidents of deaths of young babies, and a young woman being crushed to death by a falling container on 12th May 2016. The more the Ojora Family’s disdain for the dispute resolution processes heightened, the more Badia evictees hope of getting justice thinned down. Days rolled into weeks, and weeks into months, and nothing much came out of the Lagos State Governments’ conflict resolution mechanisms. The SPACES FOR CHANGE 3-man legal team knew that it was time to act and, of course, they swung into action. .
With free legal support from SPACES FOR CHANGE, Badia evictees approached the Federal High Court in Lagos to challenge the violations of their fundamental human rights to human dignity, fair hearing, liberty, property, and privacy, guaranteed under sections 34, 35, 36(1), 43 and 46 (1) & (2) of the Constitution of the Federal Republic of Nigeria. This is why majority of them stormed Justice Anka’s court to witness the court hearing first-hand. Leading SPACES FOR CHANGE’s legal team, Ms. Victoria Ohaeri presented legal arguments in response to the court’s observation that the originating summons reveals a land dispute, and not enforcement of fundamental human rights strictu sensu. It was a long, but interesting exchange of legal arguments, between the court and the evictees’ lead counsel. The court adjourned to another date for hearing of the substantive motion and argument on whether a claim touching on the infringement of fundamental rights which reveal a dispute over land extinguishes the right of the aggrieved party to be heard and determined under the Fundamental Rights (Enforcement Procedure) Rules, 2009. This is the primary issue that SPACES FOR CHANGE has framed for determination by the court. For SPACES FOR CHANGE, litigation is not just an advocacy strategy, but also, an important tool for legal education, human rights sensitization, community mobilization and collective action against forced evictions and human rights abuse. That was exactly happened immediately after the organization’s legal team stepped out of the court room. It was the time to address the evictees on what transpired in the court room; to break down and clarify the legal jargons and courtroom theatricals in a way non-lawyers can connect with. Learning about the legal issues canvassed on the behalf, the challenging technical curves, and the next legal steps to be taken in the case, helps them to manage their expectations about judicial outcomes. They know that winning in court transcends getting a favourable verdict. They fully understand that the empowerment to speak up and defend their rights without fear or favour is part of the victory. They appreciate that getting access through the door to assert one’s rights and to have them fully determined in a court of law, is equally part of the victory song. They know they are already on that path. PreviousPrevious post:We Have MovedNextNext post:Thank you, Fund for Global Human Rights!